Two years passed since I got my first IoT DevKit prototype in hand (5 in total), and now tens of thousands of people are playing with it. Love and struggle, it’s my feeling and also feedback from all of our lovely customers, RESONANCE. We’re keeping improving this lovely board: add new functions, improve the SDK, add new examples, build new development tool - IoT Device Workbench extension for VS Code, and also try our best to help people in the chat room. Now another spring, another step forward, let’s have SDK released for the lovely board and all lovely customers. Fix all build warnings pump up from underlying RTOS and libraries. Support un-sorted server cert chain during TLS handshake, this is part of TLS 1.3 feature. Upgrade Azure IoT C SDK to 1.2.14. Remove the path information from the system error which is bothering everyone and may case people feel uncomfortable. Support customzied WebServer for system configuration: WiFi setting, IoT Device Connection String setting and X.509 cert setting. Thanks everyone for using and supporting us! Please try 1.6.2 and any feedback will be appreciated. Install / Upgrade the Arduino SDK package in Arduino IDE and Arduino extension for VS Code. Time passes by so quickly, now it’s 2019. This is the first release in 2019 and the last release before Chinese Spring Festival holiday! Upgrade Azure IoT C SDK to 1.2.12. Transmit data via the onboard IrDA. Re-write the default firmware by using the new ANSI C Board APIs. Fixed compile error in wire.h. Special thanks to douglas-johnston for fixing the compile error in wire.h, thank you for your contributions and feedbacks. Happy holidays, everyone! This is a minor version increase of our IoT DevKit SDK! Upgrade Azure IoT C SDK to 1.2.10, which is the most latest version, and much stable than old version. Release the polished WebSocket library. The extern SPI is shared with the built in codec chip, so there have one pin conflict. 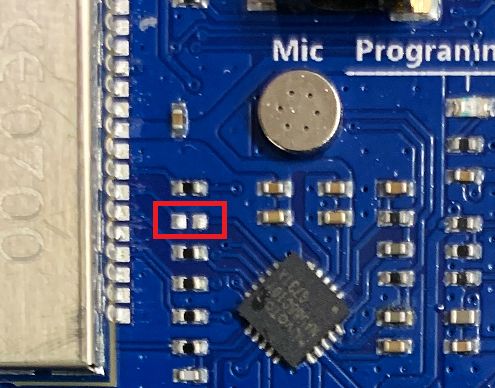 Remove this resistor can solve the SPI issue but the codec can’t work well, that means you can’t use any Audio functions if enable the extern SPI, vice versa. Special thanks to Sean Kelly for polishing the WebSocket library and Xavier Geerinck found the SPI issue, thank you for your contributions and feedbacks. My apologies for haven’t updated this page in a timely manner. Update the Azure IoT DPS SDK to 1.2.8 to support DPS group enrollment. Fix the memory leak caused by GetHostNameFromConnectionString. Make the SystemTickCounterRead thread safety. Fix the file system example. Retire the old installation package since the Azure IoT Workbench is fully support IoT DevKit now. All download links have been removed from our site. Special thanks to Oguz Bastemur and Paul Batsii, thank you for your contributions and feedbacks. UARTClass class support extra serial port (PB_6 & PB_7). Audio class support automatic level control on microphone. Add IoT DevKit firmware OTA update mini solution. Notice: Please make sure you have upgrade the firmware before running the OTA mini solution. Special thanks to capfish , Adamantinu and Chris Lovett, thank you for your contributions and feedbacks. Enable firmware update capability in bootloader. Now the bootloader can upgrade the firmware from the on-board SPI flash, this is part of the OTA programming (firmware update) feature. By integrating with the Azure Automatic Device Configuration service, the OTA firmware update function will be enabled in next release. Reduce the size of file system which builds upon the 2MB on-board SPI flash. Notice: Because it need more on-board SPI flash space to store the new firmware for firmware updating, we reduced the space of file system. So if you have files on IoT DevKit, please make sure they have been well backed up before upgrade to this new SDK. Add setVolume API to support change the audio volume. Update the DevKit Translator to use the new Audio APIs. Deprecate existing one-click installation package. Our new VS Code extension: IoT Workbench can provide better development experience for IoT DevKit, you can install it from the VS Code marketplace directly and follow this tutorial to start using IoT DevKit. So starting with 1.4.0 we only provide the Arduino board package (SDK only) and no longer to have the one-click installation package. Add System Function for power saving. Display the IP address for default firmware. Fix memory usage API issue. Special thanks to Oguz Bastemur, thank you for your contributions and feedbacks. Installation Package 1.3.7 for Windows (obsoleted). Installation Package 1.3.7 for macOS (obsoleted). Fix MQTT client reconnect issue. Filter out IoT DevKit hotspot in the WiFi configuration page. New mini-solution: Connect to IoT Edge device gateway as Modbus TCP device. Fix azure-cli bug by updating azure-cli to latest version. Allow users to disable data collection. Special thanks to Kirk Munro , fmuntean , Thomas Mutzl, thank you for your contributions and feedbacks. Installation Package 1.3.5 for Windows (obsoleted). Installation Package 1.3.5 for macOS (obsoleted). Minor fixes for the mini solution of Remote Monitoring V2. Installation Package 1.3.4 for Windows (obsoleted). Installation Package 1.3.4 for macOS (obsoleted). Add WebSocket API (not include SSL). Compile error of file missing in Linux and macOS environment. Some bugs found in security check and review. Special thanks to Alexandre Dumont , Juan Manuel Servera Bondroit , Chris Lovett , Prafull Kotecha , thank you for your contributions and feedbacks. Installation Package 1.3.3 for Windows (obsoleted). Installation Package 1.3.3 for macOS (obsoleted). Expose setOption API in DevKitMQTTClient. Fix some bugs related to memory management. Hide meaningless warning messages when build the Arduino code in VS Code. Installation Package 1.3.2 for Windows (obsoleted). Installation Package 1.3.2 for macOS (obsoleted). During the past 2 weeks, we got chance to revisit our code and did some minor changes to improve the stability and dev experience. Fix memory leak issue in IoT Hub MQTT client when there was a long drop on Wi-Fi. Improve the stability for IoT DevKit Windows/Mac installation. Support customized IoT Hub Device ID in configuring device connection string. Installation Package 1.3.1 for Windows (obsoleted). Installation Package 1.3.1 for macOS (obsoleted). Happy new year 2018! Let us talk about the fundamentals of IoT this time: the security. IoT DevKit is now amongst the first MCU devices that support Microsoft IoT Hub Device Provisioning Service, which is a helper service for IoT Hub that enables zero-touch, just-in-time provisioning to the right IoT hub without requiring human intervention, enabling customers to provision millions of devices in a secure and scalable manner. Upgrade the IoT DevKit firmware to enable DPS feature. New tool set_dps_uds is added in the configuration mode, which help to save the Unique Device Secret (UDS) into the STSAFE chip, for more detail please check this topic. Upgrade the Azure IoT C SDK to 1.1.28. 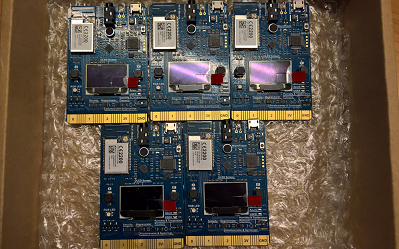 Archive the Azure IoT C SDK in the Arduino board package, greatly reduce the compile time. Enable the secure channel, protecting confidentiality and integrity of data with STSAFE chip on IoT DevKit. New mini-solution: Device registration with Device Provisioning Service. Installation Package 1.3.0 for Windows (obsoleted). Installation Package 1.3.0 for macOS (obsoleted). We are focusing on the script refinement in this release. Improve MacOS installation script to handle error friendly. Refactor Windows installation script to improve code quality. Refine VS Code task for mini-solutions to improve code quality. Installation Package 1.2.2 for Windows (obsoleted). Installation Package 1.2.2 for macOS (obsoleted). The new Audio library gives the ability to continuous recording voice through the microphone. A new version of the Audio driver library (AudioClassV2) has been added. This new version supports call-backs, allowing you to greatly simplify Arduino sketches which need to monitor and react to the current audio state as, for example, when it changes from AUDIO_STATE_RECORDING to AUDIO_STATE_PLAYING. An example Arduino sketch making use of this new feature may be found in the Audio2 folder under “Examples for MXCHIP AZ3166”. Note: The previous AudioClass library has been retained for backward compatibility with legacy sketches. (Sample sketches utilizing the AudioClass.h library may be found in the Audio folder under “Examples for MXCHIP AZ3166”.) Provide V2 version of Audio driver library to support callback in record and play. A name conflict (INADDR_NONE) in source code was generating the error “Expected ‘)’ before numeric constant”. This error (documented in Issue 169) has been corrected. A cool mini-solution was added. You can check it out here. A Resource Group Location selection option was added when creating a new resource group in task cloud provision. A privacy statement has been added during installation to allow users to choose to enable or disable data collection. Error handling during development tool installation has been improved. Installation of Visual Studio Code has been updated to better support both X86 and X64 environments. Installation Package 1.2.1 for Windows (obsoleted). Installation Package 1.2.1 for macOS (obsoleted). No more manual steps to prepare your IoT DevKit development environment on macOS! The time saving one-click installation now support macOS as well. And yes, we love bash. Upgrade IoT Hub device SDK to 1.1.23. Made IoT Hub MQTT Client as a wrapper that can be shared by all mini solutions. Enable float modifier for print/printf function. Remove json-c library and use parson JSON library instead. Bug fix: Enable HttpClient response callback when handling large response body. New mini solution: DeviceStates. Use Azure IoT Hub device twins to monitor IoT DevKit state and control the user LED. Fix gyroscope values and added acceleration sensor in SensorStatus sample. Use MQTT Client wrapper for GetStarted, RemoteMonitoring and ShakeShake mini solutions. Improve telemetry logics in mini solutions on macOS. Enable one-click install experience on macOS . Upgrade all project tasks to version 2.0. Use CMD as the default shell on Windows. Set default device upload method to use OpenOCD instead of ST-Link. Bug fix: VS Code task failure due to double quotation marks. Installation Package 1.2.0 for Windows (obsoleted). Installation Package 1.2.0 for macOS (obsoleted). Notice: If you are upgrading from version 1.0.2 or even earlier, please upgrade your firmware first. Minor fixes of internal Azure IoT Hub Device APIs. Installation Package 1.1.1 for Windows (obsoleted). Installation Package 1.1.1 for macOS (obsoleted). IoT DevKit now officially has full support for ST-SAFE, the security chip that provides secure authentication and data management for IoT solutions. Since it’s enabled on bootloader level, a firmware upgrade is mandatory to make the IoT DevKit work properly. Upgrade the IoT DevKit firmware to enable STSAFE. Bug fix: Under bad network environment, the Device SDK in mbed OS occasionally crashes. Add more NTP servers for better globalization support. Tune OLED library display performance. Massively improve Azure Functions deployment(task cloud-deploy) performance. Improve ‘Shake, Shake’ example flow further by adding more logging data on the display. Visual Studio Code extension for Arduino now use tree view to display Arduino examples. Installation Package 1.1.0 for Windows (obsoleted). Installation Package 1.1.0 for macOS (obsoleted). Summer does not mean slow down. We further enriched our project catalog and tuned their performances. And from our user feedback, we added the logic to detect the latest firmware so that you will no longer miss our new stuff. Enable detection of latest firmware version and display on the screen. Add support for audio playback API. Add ‘DevKit Translator’ example for IoT DevKit to understand more languages . Add ‘Door Monitor’ example uses third party email service to send notifications. Replace manual steps with VS Code tasks for ‘Connect to Azure IoT Hub’ example. Improve Azure Functions stability and performance used by examples. Improve the telemetry API, and add more telemetry for ‘Shake Shake’ to track the running status. Adapt VS Code task for all sample projects to remove tedious manual steps. Bug fix: Occasionally installation will fail to set Arduino custom board URL. Installation Package 1.0.2 for Windows (obsoleted). The optimization continues. We are now supporting VS Code tasks on macOS as well, so you can easily provision and deploy our ‘Shake, Shake’ sample project on macOS now. To further smooth the development tools and package installation, we are using the official MSI for the Windows Azure CLI 2.0 installation, so Python installation is no longer needed. For all other underlying improvements, checkout our release notes for details. Remove the dependency of Python installation by using Windows Azure CLI 2.0 MSI (v 2.0.9). Upgrade to the latest version of VS Code (v 1.13.1) and Arduino Extension (v 0.2.4). Switch to Azure CDN to accelerate the package downloading speed. Preview cloud provision, deploy and device upload tasks for “Shake, Shake” mini solution in VS Code on macOS. Switched to ARM (Azure Resource Manager) template for provisioning Azure services. Put Azure Function creation logic into cloud provision step to further isolate the tasks. Add telemetries to distinguish each mini solution from BI perspective. Installation Package 1.0.1 for Windows (obsoleted). After a month work of stabilizing the code, fixing bugs and adding more samples, we are happy to release the v1.0.0 for our IoT DevKit. And soon we will open source the stacks including firmware, toolchain and all sample projects code. Please check release summary for details about this update. Install pip with get-pip.py script. Optimize error handling when running commands. Adapt to update of Azure subscription return format using Azure CLI. Bug fix: Memory leak on socket layer of Wi-Fi driver. Bug fix: Add retry logic to improve the stability of Azure IoT Device SDK. Refine library APIs to follow Arduino Standard like function naming conventions. Add OLED draw method to control every pixel in display screen. Add support for file system based on mbed file system implementation. Add ‘Connect to Azure IoT Hub’ example and documentation that align with other Azure IoT Hub get started tutorials. Add ‘Remote Monitoring’ example and documentation that make IoT DevKit connect to Azure IoT Suite. Add ‘MQTT Client’ example and documentation that send MQTT messages to public free MQTT broker. Shake, Shake: Use testing Twitter bearer token as default, developer can replace it with her own by following the tutorial. Shake, Shake: Add delay and retry logic when not receiving any message due to function delay. Installation Package 1.0.0 for Windows (obsoleted). Some bug fixes before IoT DevKit debut on //Build and Maker Faire Bay Area. This is our first public release of the Microsoft Azure IoT Developer Kit.